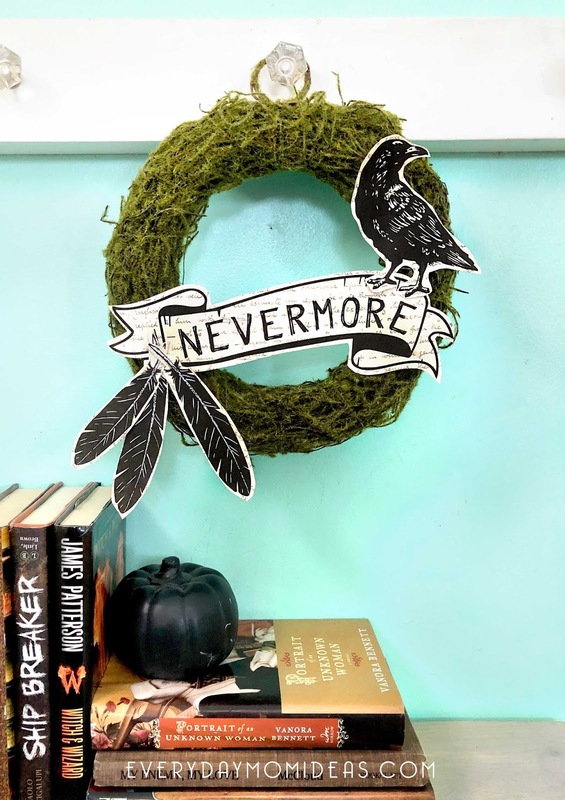 Edgar Allen Poe's poem "The Raven" was the perfect inspiration for my Halloween decor wreath.The Raven is one of the most famous poems of all time. 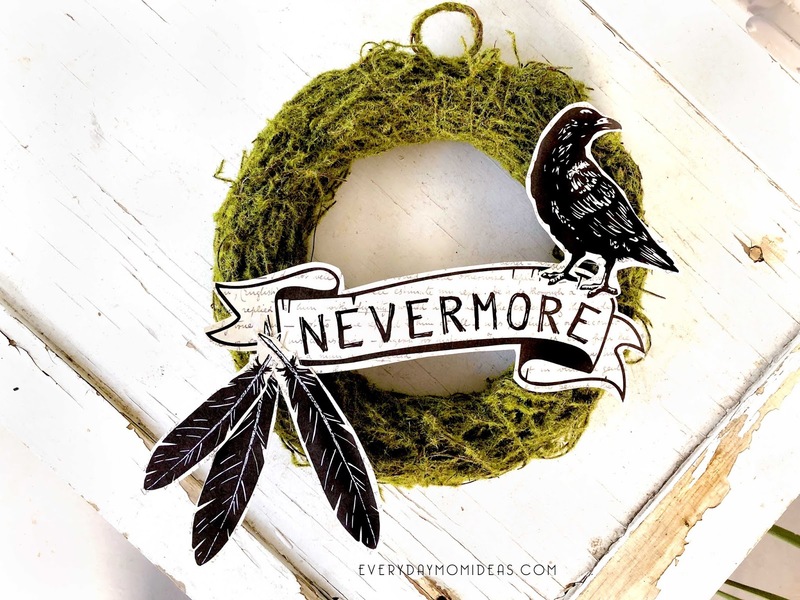 Edgar Allen Poe's poem is quite unsettling and takes place late at night when a young man receives a most disturbing visitor, a raven named Nevermore. The visit from the raven eventually leaves the young man crippled on the floor, going insane from his own painful loss and thoughts while the raven lures overhead with his cruel eyes. Cuz whats more scary than going insane and talking black birds to help you get there? 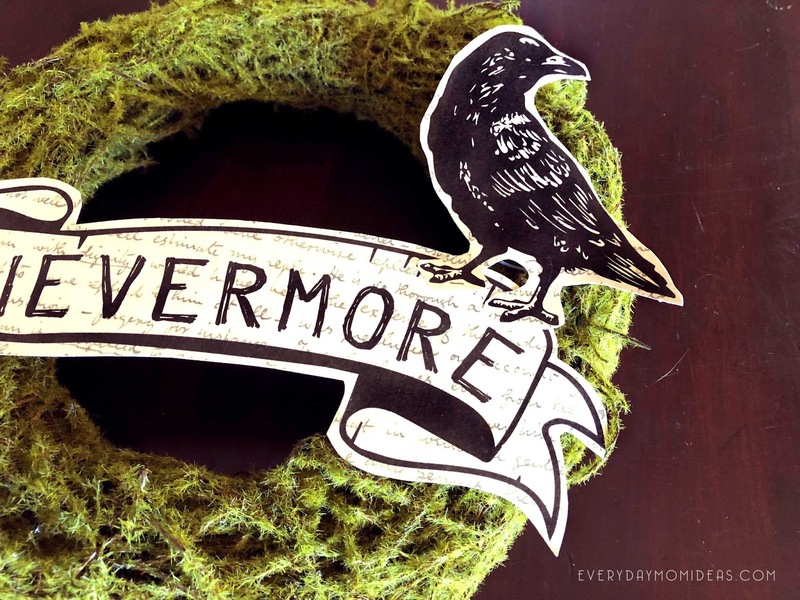 One really fun detail I included with this printable is the background of the artwork is a photocopy of the real handwriting of Edgar Allen Poe!!! Say what! I love little secret details like that. This year for my Halloween/fall decor I wanted to go with a more vintage nature vibe with lots of green, brown and black. I live in an old 1928 bungalow home and I love coming up with home decor ideas that incorporates the historic charm of my home. I love the mossy wreath because it adds that green pop of color in a natural way plus moss has kind of a spooky vibe to it I think. 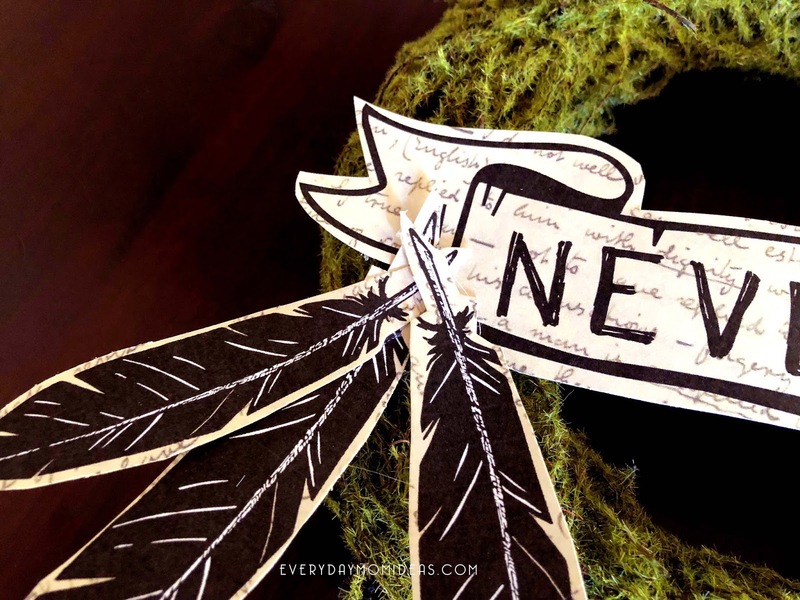 I kept the whole wreath simple with just three paper elements to give it a more clean and modern touch. Sometimes I think wreaths can get a little too busy and I wanted to challenge myself in making something eye catching but ultra simple for anyone. TIP: I also decided to use a bubble cut method when cutting out the elements so that the background of the handwriting of the great Edgar would be more noticeable with the bird element and the feathers. In all my decor and holiday decor I make sure and to always use books. We have a great fireplace and mantle with side bookshelves and there is always new and fun ways to include and feature new books we already have. 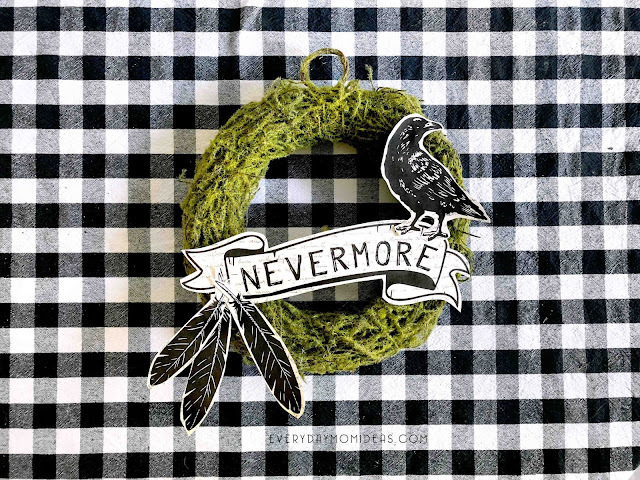 A Nevermore wreath fits right in with our love of literature and all things books. I couldn't be happier with how the whole quick project turned out! TIP: What is also great about this little craft is that after Halloween you can pull off the paper and glue on new embellishments for the next holiday. 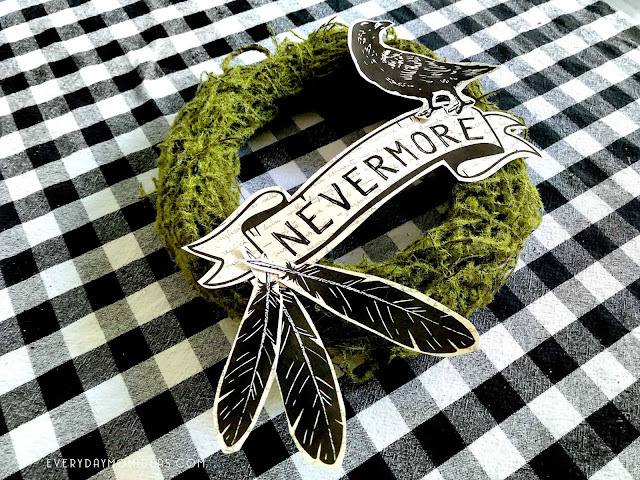 A little glue goes a long way with paper crafts. You only need a tiny bit of hot glue to secure these paper printouts to your wreath. 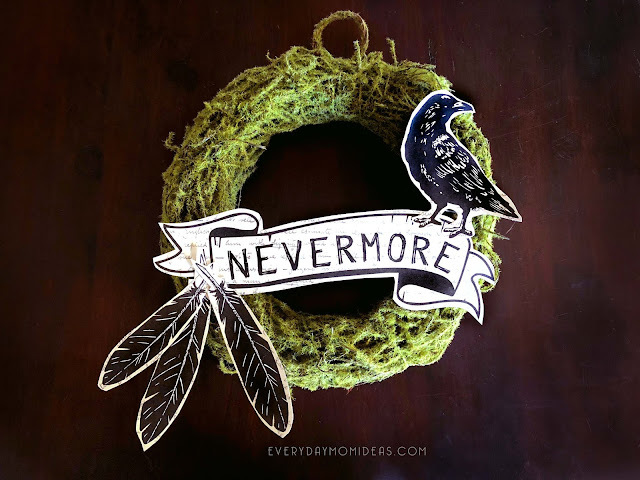 It will also make it easier to replace the paper elements without ruining your moss wreath. Get the Nevermore Paper embellishments for this Halloween wreath here via google docs. Also, remember Sharing is Caring. 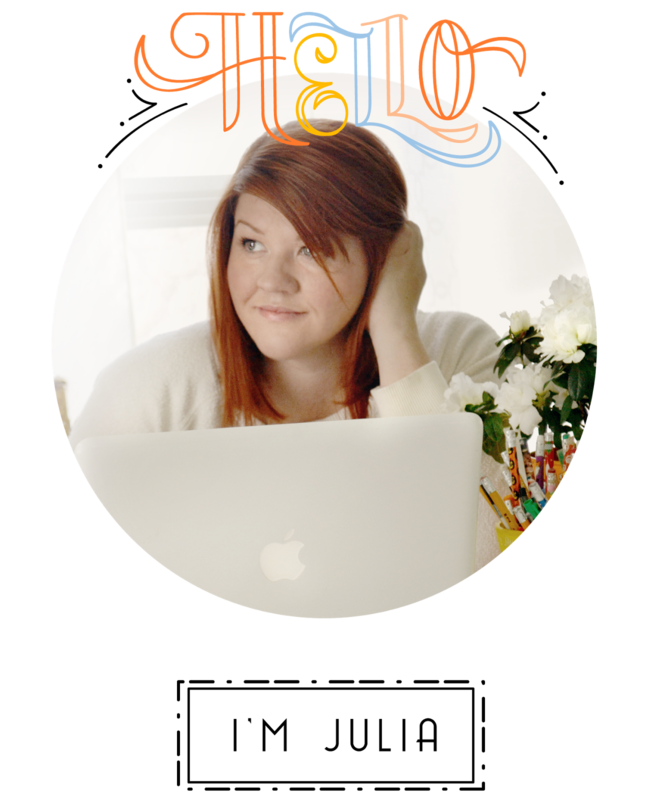 So please share these Pinterest friendly images below with your friends and family or to inspire you next year.